DISCLOSURE: I received a free NERF Rebelle Heartbreaker Bow from NERF and BzzAgent to try and review. 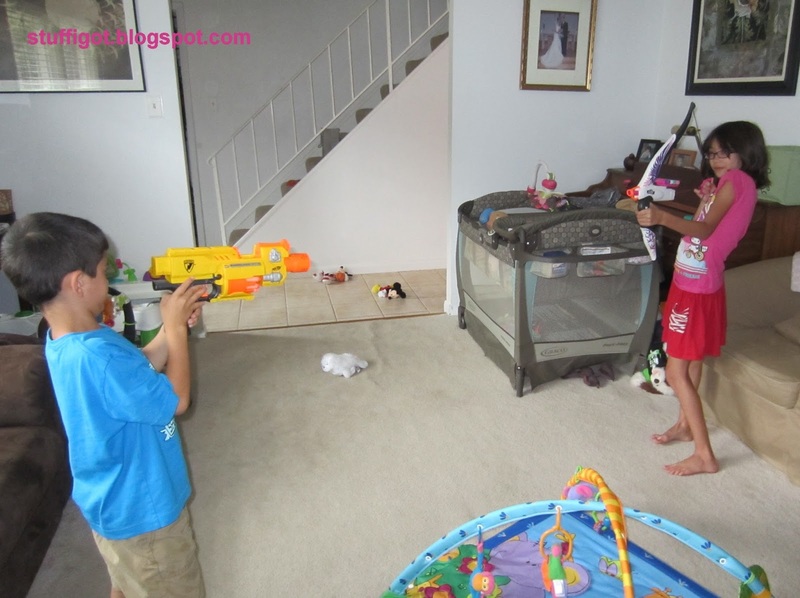 My boys love playing with their NERF guns. We have darts all over the house. My 9 year old daughter will play with them from time to time, but doesn't like to admit that she likes to play with "boy toys." She says she'd be embarrassed if anyone saw her or heard about her playing with them. 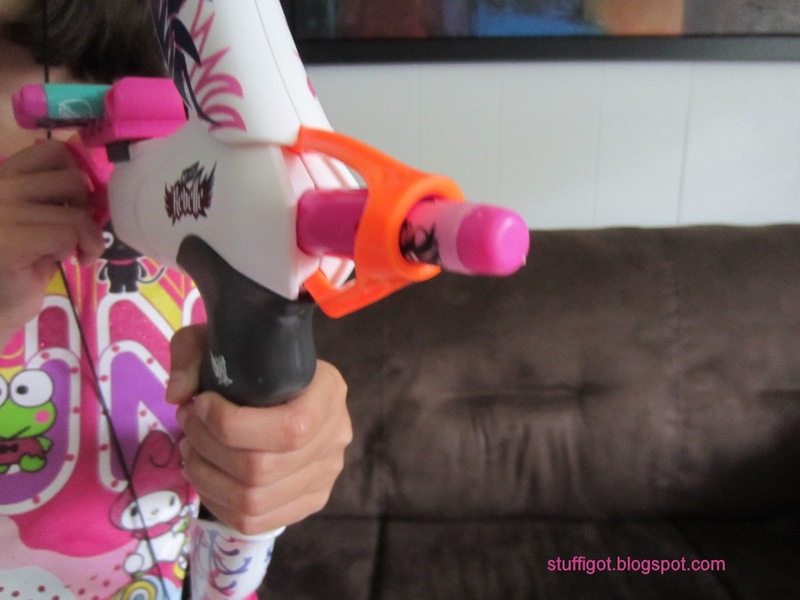 Luckily, NERF has come out with a line of crossbows and blasters -- just for girls! NERF Rebelle! 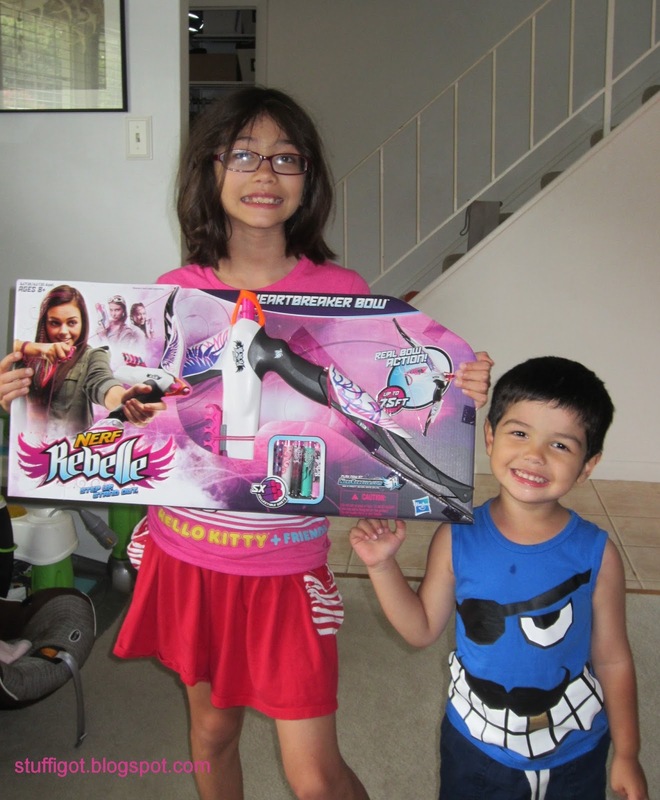 When I told my daughter that we would be getting to try the new NERF Rebelle line, she was so excited! Finally, she was going to get to shoot darts with her brothers -- but, with her own gun! Here she is with one of her little brothers, holding up the box. 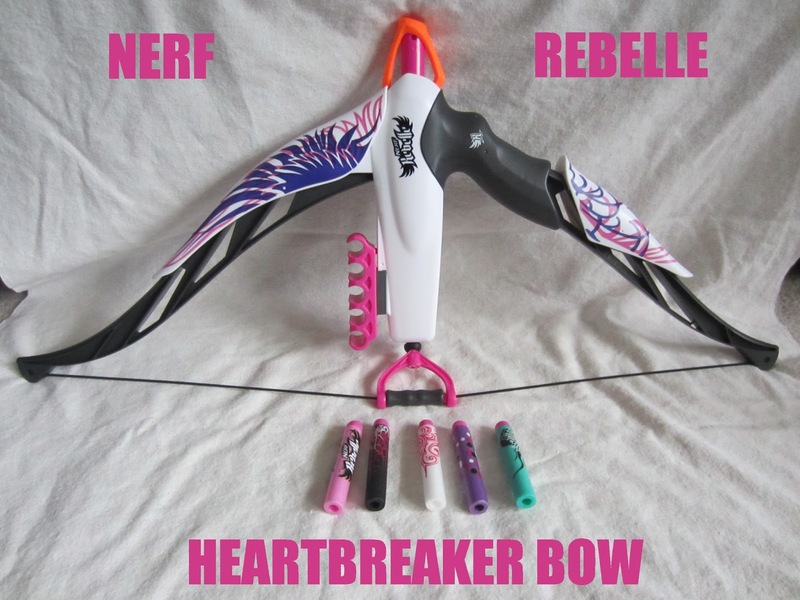 The Heartbreaker Bow works like a real bow, but uses darts instead of arrows. It comes with 5 collectible darts. Your daughter can blast darts up to 75 feet away! The bow can stow up to 5 darts for easy reloading. The bow is easy to load. Just stick the dart in the front. To fire, pull back on the string and then release. It wasn't long before my daughter and her brother were shooting at each other with darts! Definitely! It's great that NERF has come out with a line for girls! 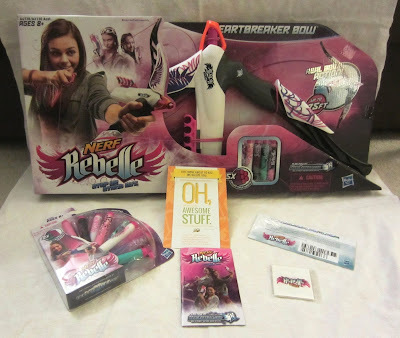 My daughter loves her bow and wants to get all the other toys in the NERF Rebelle line. 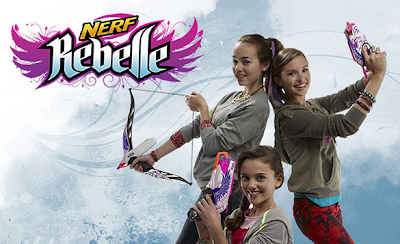 NERF Rebelle also has an interactive website: www.nerfrebelle.com, where your daughter can create a NERF Rebelle-themed avatar and complete virtual missions. The Heartbreaker Bow retails for $19.99. The Guardian Crossbow retails for $24.99. It includes 6 collectible darts and a front-loading barrel. Darts are fired revolver style. The Sweet Revenge Dart Kit retails for $19.99. It includes a 5-dart revolving blaster, 5 collectible darts, a belt clip holster and Vision Gear eyewear. The Pink Crush Blaster retails for $9.99. This is a 2-in-1 blaster that converts into a crossbow. It includes 4 collectible darts. The Power Pair Pack retails for $12.99. It includes 2 mini blasters that your daughter can share with her BFF. They fit right in their pocket or purse. It includes 4 collectible darts. The Mission Central Application Rail Mount retails for $14.99. It lets you mount your iPhone or iPod Touch on your bow or blaster. Download the free NERF Rebelle Mission Central app and complete missions. Dart Refill Packs retail for $9.99 and include 12 collectible darts in 6 stylish patterns. The Vision Gear eyewear can be bought separately for $6.99. The Dart Diva Bag and Belt retails for $14.99. It includes 10 darts and an accessory belt. It's currently available to purchase online at all major online retailers, like Target.com and Amazon.com . It will hit store shelves starting September 1st. This looks like a great gift idea! My 7 year old would love one. Thanks for the review. You're welcome! Yes, my daughter received two more items from the NERF Rebelle line for her birthday and is always playing with them!